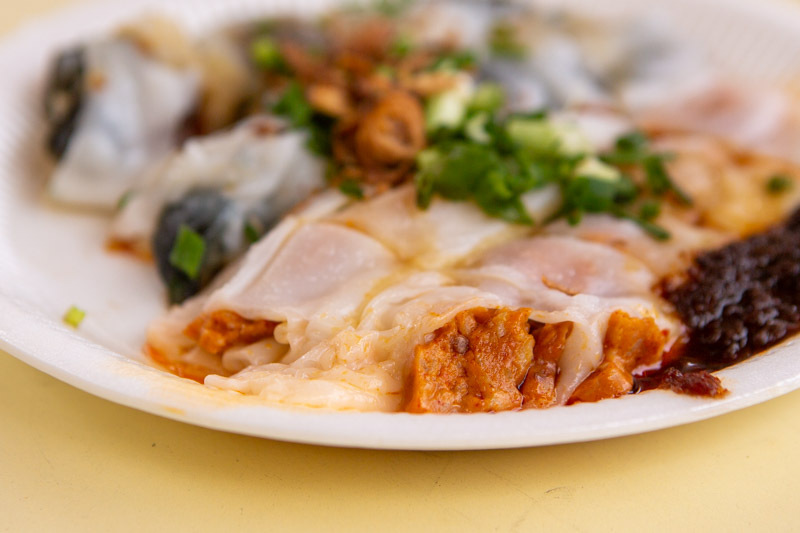 Everyone has a favourite dim sum item and mine has to be chee cheong fun. So wherever I go, I’m always on the lookout for places which serve up a delicious plate of chee cheong fun. Fortunately, I’ve found one in one of my favourite hawker centres in Singapore. 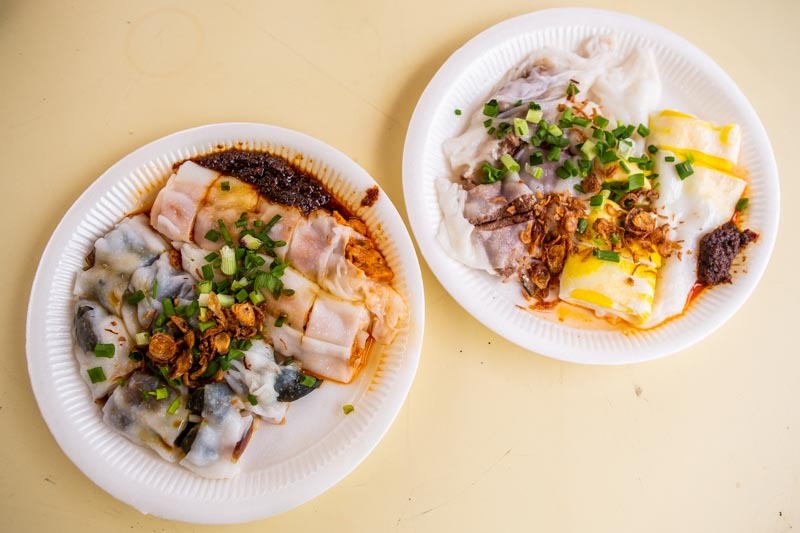 Located in Old Airport Road Food Centre, Freshly Made Chee Cheong Fun (现做现卖猪肠粉) is a chee cheong fun speciality stall. 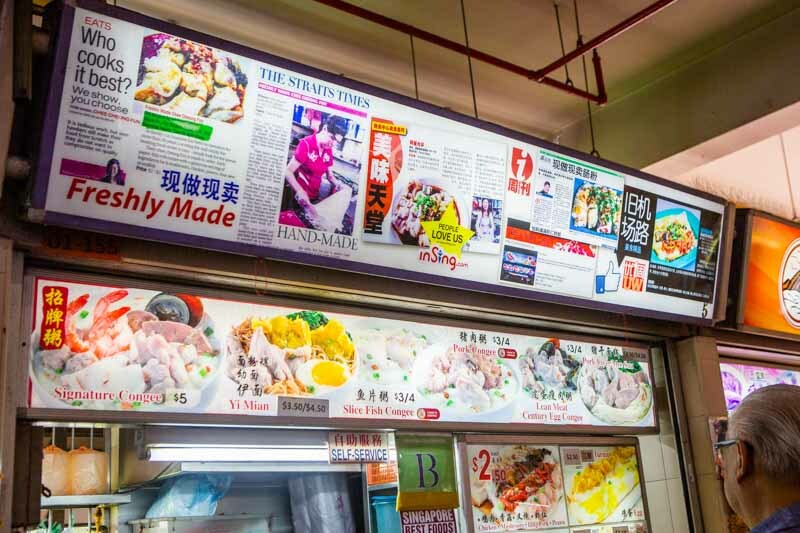 Run by a pair of sisters, this second-generation stall has been around at its current location for about 20 years. Yvonne’s mother first started the business in Lorong Ah Soo. 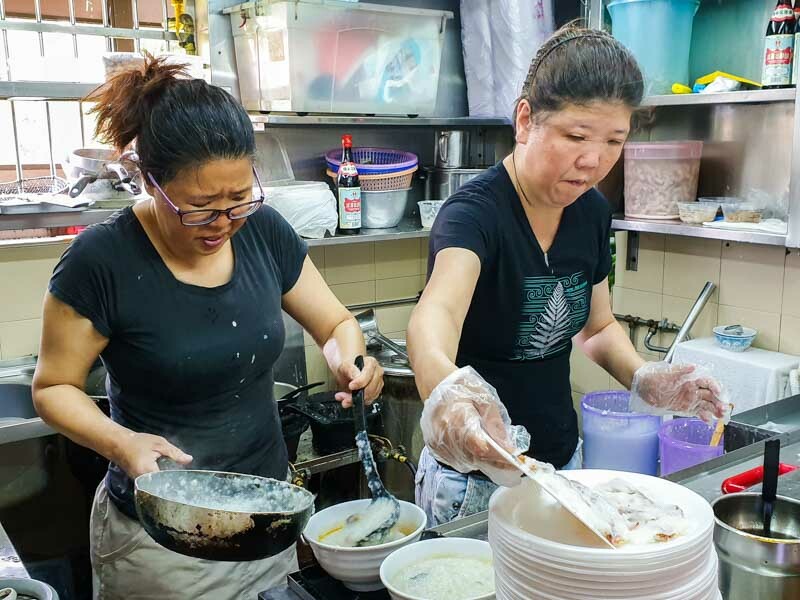 She learnt the ropes of making chee cheong fun while working for a Hong Kong chef in a restaurant. 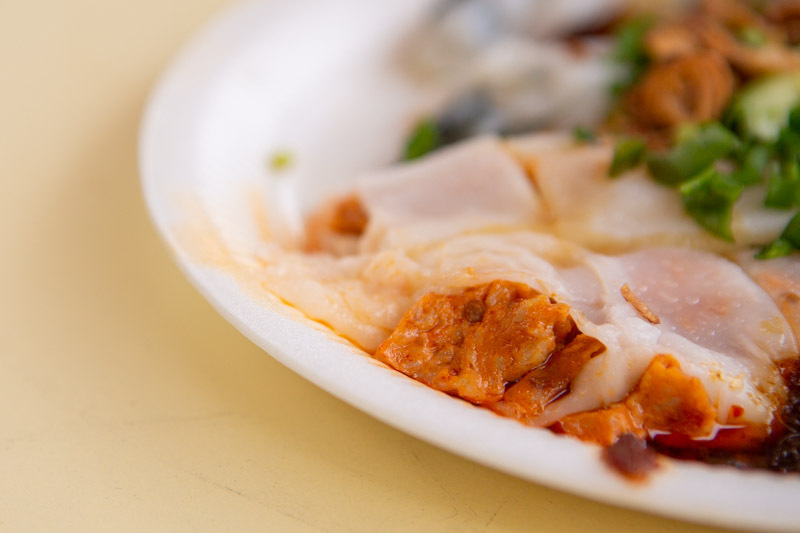 Back then, Freshly Made Chee Cheong Fun only had three basic fillings. 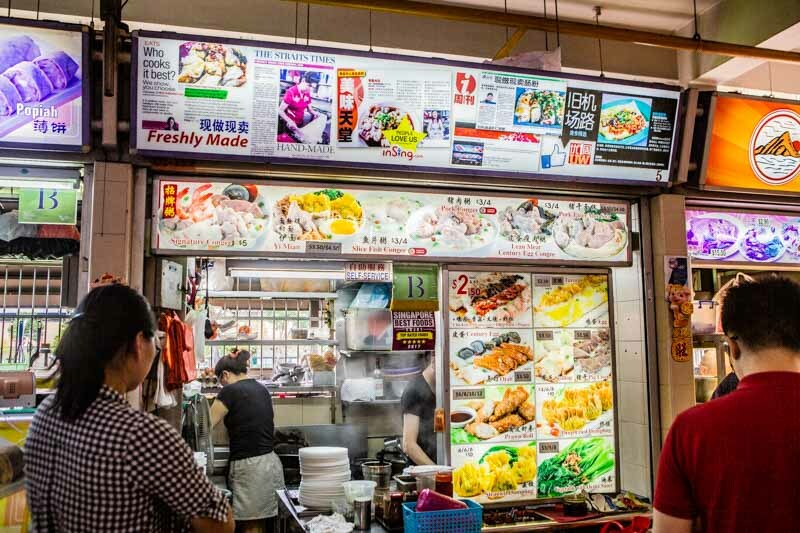 Today, they pride themselves on having 10 unique fillings for their chee cheong fun! 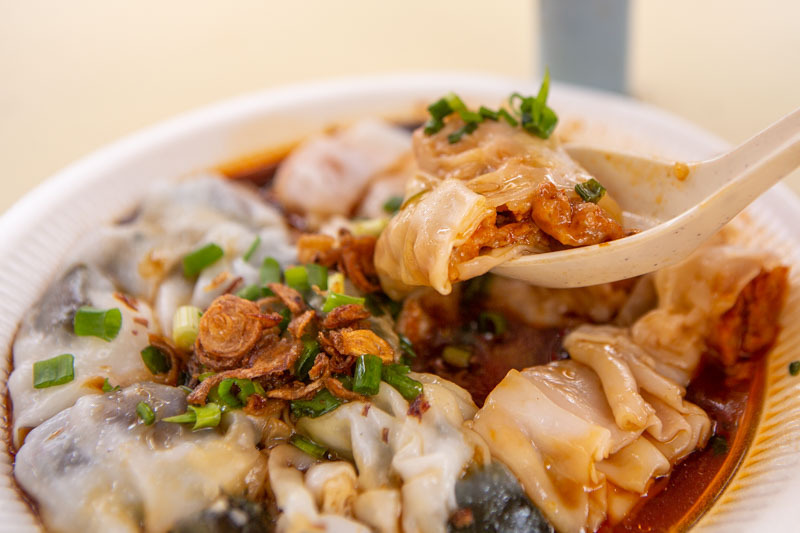 Apart from chee cheong fun, Freshly Made Chee Cheong Fun also serves up a variety of other dishes. They have a whole range of traditional congees, as well as side dishes. That said, we were there mainly for their chee cheong fun dishes. 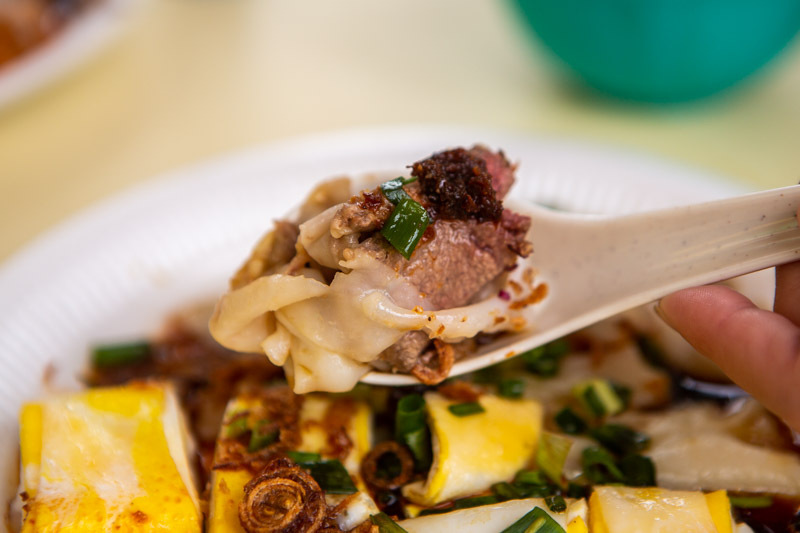 Upon their recommendation, we started off with the Pig Liver 猪干 (S$2.50) chee cheong fun, a concept they brought back from their trip to Guangzhou, China. We noticed that their pig liver slices were remarkably thick. The owner said she personally prefers them chunkier and meatier. I had to agree as it tasted like a really lean piece of pork. Juicy and tender, the pig liver slices still had the quintessential powdery texture, dissolving in my mouth spectacularly. They also made for a good contrast against the silky rice rolls. Since they were so palatable, I reckon they’d appeal to everyone, including non-pig liver lovers! 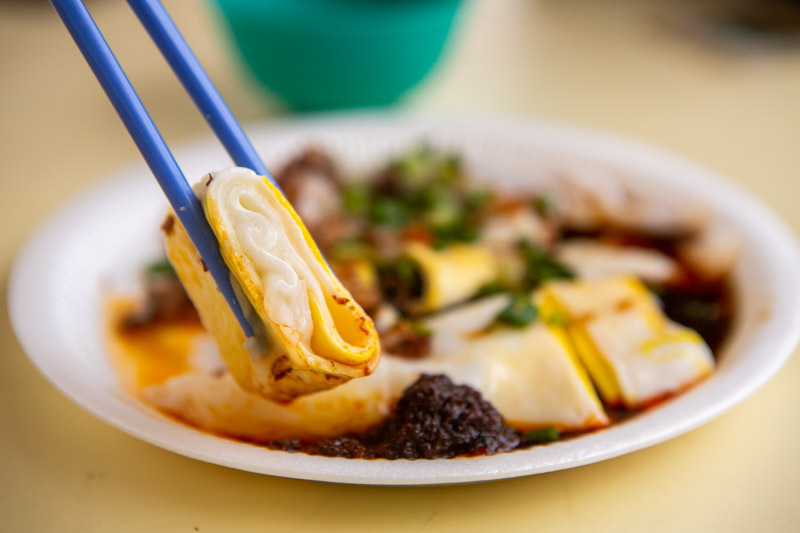 Similarly, they got the idea for their Egg 鸡蛋 (S$2.50) chee cheong fun from their trip to Guangzhou. It’s a style native to the locals there too. 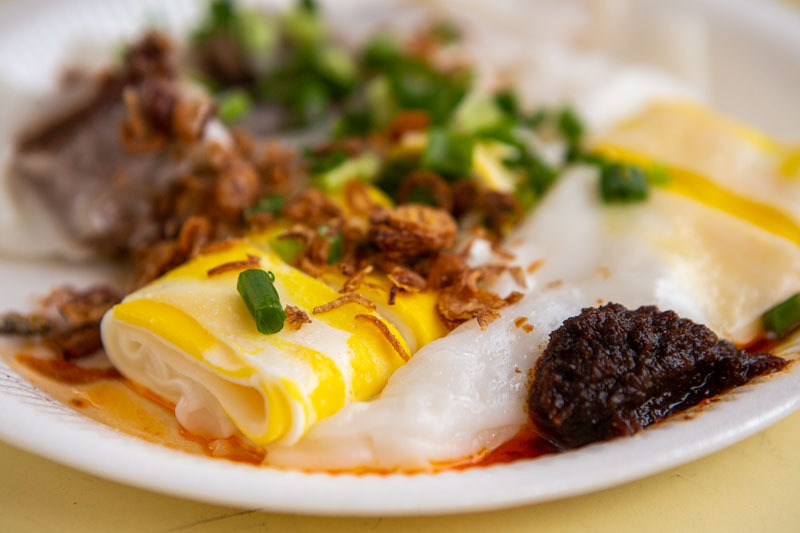 I was very eager for it when I saw them crack an egg over the paper-thin chee cheong fun sheets. It reminded me of how the fried eggs in Ramly Burgers are prepared, if I’m honest. After it came out from the steamer, the dish had a swirly yellow hue which intrigued us. The steamed egg had a curd-like texture which complemented the soft and bouncy rice rolls well. However, the flavour profile of the dish didn’t appeal to us as much. As both the egg and rice rolls were naturally mild in flavour, combining them both didn’t elevate the overall taste. As such, we found ourselves heavily relying on the sambal chilli that they provided us with. It had an extremely smoky flavour which we thoroughly enjoyed. 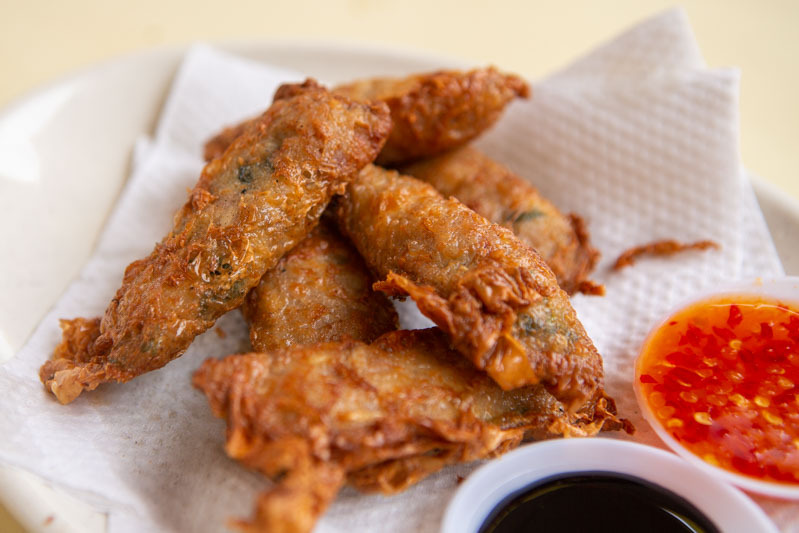 Not only that, it also contained crunchy bits of ikan bilis which added another dimension of texture to every bite. 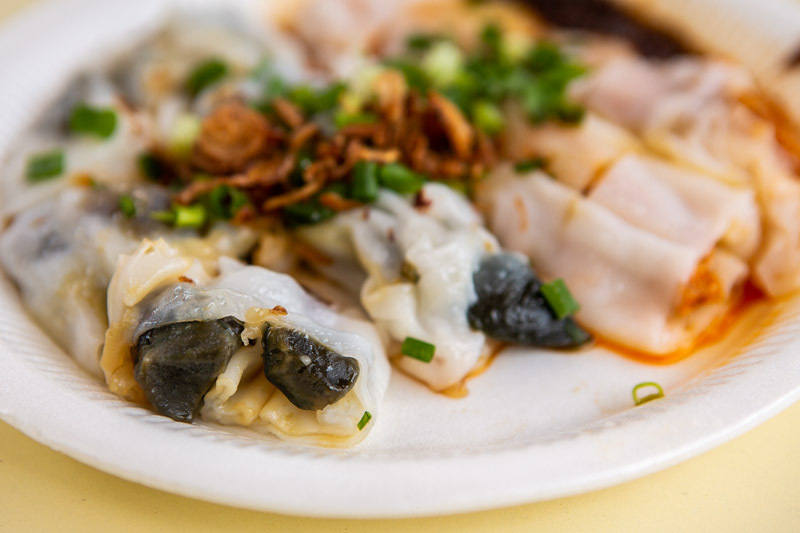 Moving on, we tried Freshly Made Chee Cheong Fun’s Century Egg 皮蛋 (S$2.50) chee cheong fun. This time, the idea didn’t come from their Guangzhou trip. Instead, they came up with the filling because the owner herself loved it. Yvonne explained that she liked how the creamy texture of the century egg makes for a really good contrast. Its mild umami essence also complements the plain rice rolls very well. Again, I found myself agreeing with her after trying the dish. 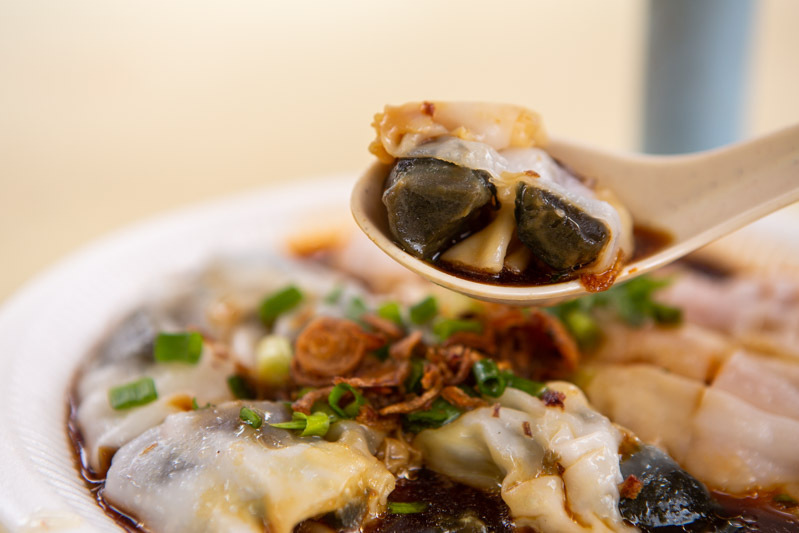 We didn’t think century eggs would go so well together with chee cheong fun. Like the Pig Liver chee cheong fun, this dish pleasantly surprised us. 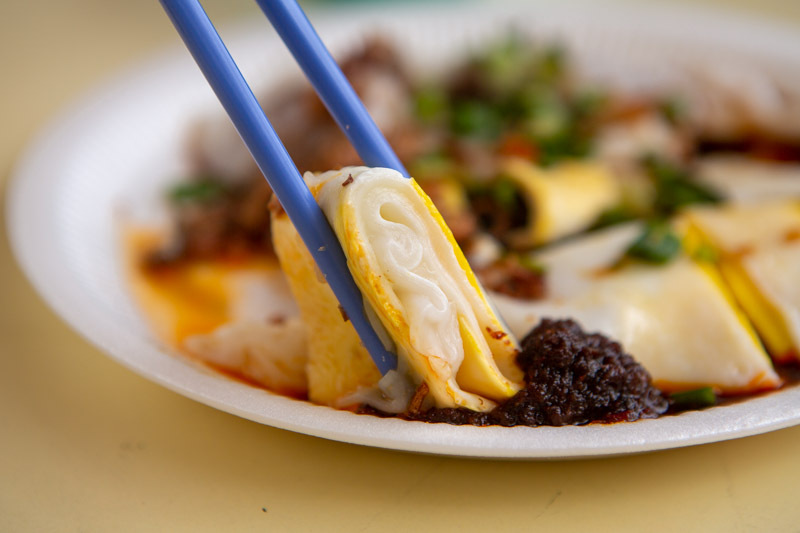 On the other hand, the Otah 乌打 (S$2.50) chee cheong fun is the personal favourite of Yvonne’s sister, the stall’s chee cheong fun maker. When the sisters told me that they source their otahs from Muar, Malaysia, I became super excited. Muar’s otahs are well-known for having large chunks of fish in them, hence I was really looking forward to it. As expected, the dish blew me away. Firstly, the otah came in very huge chunks, which we could see through the slightly translucent rice rolls. 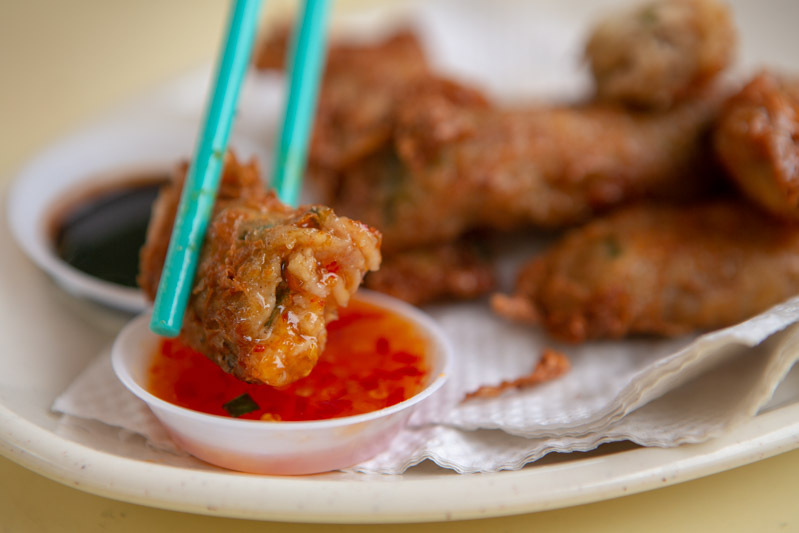 What surprised us, in fact, was how spicy the otah was. Just the very first bite left me scurrying to find myself some water. This particular otah of theirs is much spicier than typical otahs from Muar, I’ll tell you that. Nevertheless, because of how fresh and moist it was, I kept going back for more. The otah had an abundance of fish meat which made the dish feel really substantial. This was my personal favourite of the lot! To complete our meal, the owner insisted that we try their Prawn Roll 腐皮虾枣 (S$6/S$8/S$10/S$12), handmade using their mother’s recipe. 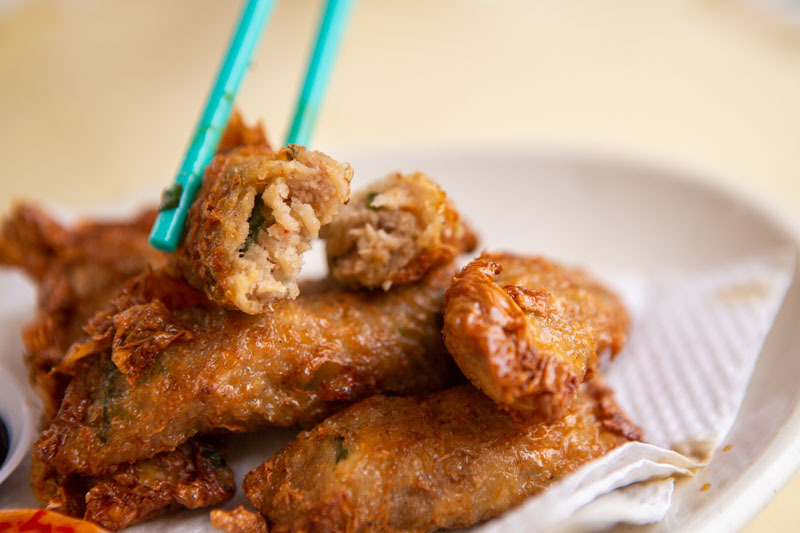 Crackly on the outside, the hei zho had an abundance of ingredients in it, which included pork and prawn meat. The slightly salty meats were incredibly succulent. However, it was actually the large and generous chunks of water chestnuts which sealed the deal. We loved how the crunchiness and moisture cut through the greasiness of the meat. So if you’re looking for chee cheong fun with unique fillings, Freshly Made Chee Cheong Fun is definitely a place you should visit. 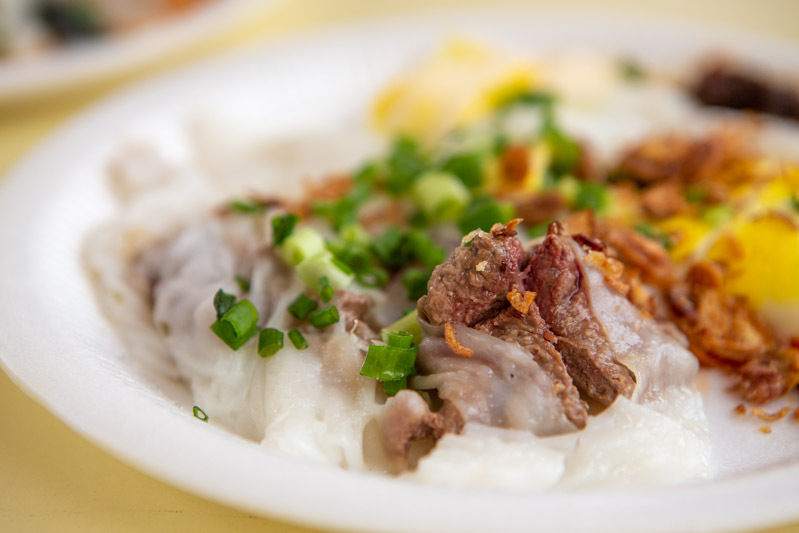 Furthermore, they’re open from morning till night, so you can get your chee cheong fun fix anytime!